Ascending or descending a curb or single step is a risky proposition according to the wheelchair manual. The manual contains many bold exclamation points in a triangle next to each paragraph and drawing of ascending or descending a step or curb. Repeated warnings caution the wheelchair user to never attempt to ascend or descend a step. NEVER. Read carefully. This ascending and descending a single step or curb is a seven step process. 1. NEVER attempt to negotiate a curb or single step without assistance. 2. Instruct your assistant to stand at the rear of your wheelchair, with the front of the wheelchair facing the obstacle. 3. NEVER attempt to negotiate any such obstacle backward. 4. Instruct your assistant to tilt the chair up on the rear wheels so that the front casters clear the curb or step. 5. Instruct your assistant to slowly move the chair forward and to gently lower the casters to the upper level as soon as you are sure that they are beyond the edge of the curb or step. 6. Instruct your assistant to continue to roll the chair forward until the rear wheels contact the face of the curb or step. 7. Instruct your assistant to lift and roll the rear wheels up too the upper level. Wow, there is a whole lot of instructing going on. What the above instructions do not take into account is the need to remove or rotate the anti tippers. Anti tippers according to the manual "were designed to prevent falls from the wheelchair". I am sure anti tippers do indeed prevent some people from falling. They are also completely impractical for any person who is independent and, to use manual jargon, a skilled rider. Let me describe the wheelchair manual way to safely cross the street and ascend and descend a curb. Wheelchair manual way is an alternate universe I have never been to. 1. Check the weather forecast. Avoid direct sunlight, sand, dirt, snow and all adverse weather conditions. 2. Never be alone. Always be dependent upon a caregiver or assistant. 3. At the curb come to a complete stop. Have your caretaker or assistant rotate the anti tippers. 4. Follow above steps 4 through 7. The method for ascending and descending a step or curb is pure fantasy. An independent person such a myself has no assistant. The entire point of the wheelchair is to insure independence. When I cross the street I put my head down and in a crowded urban environment wear a baseball cap. I have learned it helps to keep my head down and make it impossible for bipeds to see my eyes. Without eye contact bipeds are far more likely to move laterally and out of my way. When I cross a street or approach a curb I do so with as much speed as humanly possible. When I am mere inches from the curb I pop a wheelie, lean forward and push the rear wheels as hard as humanly possible. Depending upon how fast I am moving I can independently ascend a curb of 6 to 8 inches. As for descending, I face the curb, pop a wheelie and drop of curb. This is effective but a bit jarring on the lower back. Sometimes if the concrete or asphalt is in bad repair I do exactly what the manual instructs me not to do--I negotiate the curb backwards. Lean all the way forward and back off the curb. This is very effective and safe. Aside from ascending and descending curbs, ramps too are dangerous. I kid you not! No ramp, slope, or hill should exceed 10 degrees and be more than 10 feet or 3 meters long. No slope or hill should ever be navigated alone. If you need to use a short ramp 10 feet (3 meters) or less, the angle of the slope should not exceed 10 degrees, which corresponds to a slope of 17.63%, a rise or 1.74 feet (0.53 meters) over a distance of 10 feet (3 meters). Make sure to be assisted by a caregiver who has the physical ability to retain the wheelchair and its occupant. The wheelchair must always point facing up the slope. The caregiver should always remain in the bottom of the slope to retain the wheelchair. Always lock the anti tip in the safe position. Follow the same words of caution for a hill or slope of 10% or less. Again, these instructions are all too easy to laugh at but someone had to do some basic math. Calculations were made and perhaps some field testing was involved. Aside from the loss of independence, one must have an assistant mind you, I would estimate half of the ramps I regularly use are more than a 10% grade or 5.7 degree angle. Bridges come to mind as do many bike paths I use regularly. Needless to say, no ramp or slope should be navigated when wet. Slippery surfaces are especially dangerous. The manual also includes an entire section for caregivers. I can only assume this section is where I learn how to tell my assistant or caregiver what to when the weather is perfect and environmental conditions permit me to go outside. Among the highlights in the caregiver section include the fact a wheelchair user should never be left unattended. If unattended the caregiver should engage the wheelchair locks and place the beloved anti tippers in the safe position. Caregivers should also ensure the wheelchair has push handles and when pushing a wheelchair to stand in an upright position. It is equally important to "ask an experienced caregiver to explain safe assistance methods to you". I am not sure what to tackle next. The wheelchair manual has truly endless fodder for laughs. Transferring out of the wheelchair is dangerous. Getting dressed in a wheelchair is strongly discouraged. Stairs are out of the question and warrant an entire bold faced paragraph that discuss the great danger they pose any wheelchair user. I also cannot under any circumstances use a bus or any paratransit service. The wheelchair manual is emphatic with regard to all mass transit. Motion Composites cannot, and does not, recommend any wheelchair transporting systems. For goodness sake, the manual is equally emphatic it is not safe to transport the wheelchair in a car. The front seat for the wheelchair is out of the question and even the rear seat is not recommended. It must be placed and secured in the rear of the vehicle, preferably the trunk. How am I, an expert rider, supposed to get the wheelchair in the trunk is not explained. More tomorrow. My new wheelchair came with a 24 page manual. I have never read a wheelchair manual before. I am however a fan of manuals. I am one of the few people who actually reads manuals that come with a computer, smart phone, car, appliance, or any mechanical device. My son relentlessly teases me about this. When he visited me a few weeks ago we read over the wheelchair manual. Gales of laughter ensued. I have been using a wheelchair all wrong for over forty years! Exactly what am I doing wrong? Apparently I am not supposed to go out in adverse environmental conditions. The performance of my wheelchair can be profoundly affected by sand, mud, rain, snow and rough surfaces. Apparently "exposure to water or excessive moisture can be damaging and may even cause the wheelchair to corrode over the long term. DO NOT leave your wheelchair in humid environments such as the bathroom (e.g. while taking a shower). Store the wheelchair in a dry and cool location. The wheelchair should be stored away from direct exposure to sunlight. If the wheelchair is wet, dry all parts with a cloth before storing it. DO NOT use your wheelchair in the shower, pool, or other water situations". I am expected to avoid exposing my wheelchair to direct sun light. That will be a bit difficult given the fact the Denver area gets over 300 days of sunshine a year. I had no idea the bathroom was off limits. It is assumed every wheelchair user lives with another person--specifically a caretaker. This mysterious person is responsible for removing the wheelchair from the bathroom when the shower is on. What becomes quickly apparent when reading the manual is that no wheelchair user can be independent. The wheelchair itself is not designed to be used independently. At all times the wheelchair user should be assisted by caregivers. On each and every page there is mention of caregivers. On each and every page the manual, in no uncertain terms, the wheelchair user is warned to "CONSULT your doctor, nurse, or therapist". I don't know any physician that has a remote understanding of how to use a wheelchair. This advice makes no sense. Certain items appeared to be constant in the manual and the wheelchair industry in general. Wheelchair manufacturers love anti tippers. A wheelchair should NEVER be used without anti tippers. The manual is emphatic about this. I did not order anti tippers for my new wheelchair. I did not order a seat belt either. The wheelchair came with a seat belt and anti tippers installed on the frame. Wheelchairs come with all sorts of crap attached to them. I get this. There is much profit to be made with the installation of needless parts. Anti tippers are not cheap. On my chair they cost $112. The positioning seat belt was $33.90. The padded calf strap was 72.00. Carbon fiber side clothing guards were $232. The list goes on and on. Thus the stated price of the wheelchair and the actual cost are very different. My wheelchair listed for $2,076.00. By the time I was done with various upgrades the price tripled. The carbon fiber frame upgrade alone was $1,360.00. I am well aware the manual exists to cover Motion Composites (the Canadian manufacturer) liability. What I find bothersome are the assumptions made. A wheelchair such as mine is well designed for a "skilled rider", the term consistently used in the manual. Yet if used as suggested in the manual manual would render such a person powerless. The person using the wheelchair is emphatically directed to consult experts such as physicians, therapists, qualified technicians for adjusting the wheelchair etc. At no point is the "skilled rider" considered the expert. 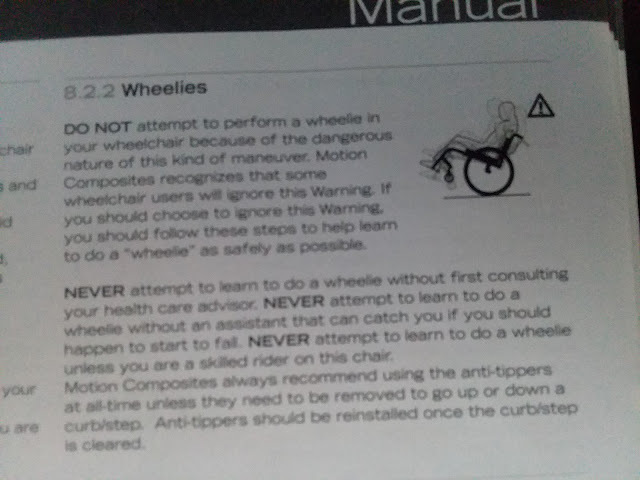 My favorite part of the wheelchair manual is the short section on popping wheelies. Popping a wheelie is a "dangerous maneuver". The manual is litered with warnings symbolized by an exclamation point inside a triangle. The message is not subtle. Yet this does not stop Motion Composites from using the image of a man using the wheelchair popping a wheelie! However inside the manual there are all sorts of warning about this "dangerous maneuver". Motion Composites knows "some wheelchair users will ignore this warning". This warning will indeed be ignored. Most wheelchairs are now being manufactured with small solid front wheels typically less than four inches making wheelies are an essential skill. I learned how to pop a wheelie long ago. The year was 1978. I did not consult my health care provider. I did not have an assistant who could catch me before I fell. I was not a skilled rider at the time. I learned how to pop a wheelie at college shortly after I was paralyzed. A friend explained how to pop a wheelie and demonstrated his skill. I then proceeded to go to my dorm room, drink six cans of beer and give wheelies a try. After falling about a dozen times I had it down! I can't help but wonder about the wheelchair manual. Do people in the industry actually believe what is written? Are anti tippers essential to a wheelchair user? Is popping a wheelie really dangerous? Do people actually design wheelchairs that cannot be used in adverse environmental conditions. I want to scoff at these questions but cannot. I think of my friends who use larger impressive, and complex power chairs. These modern marvels cost as much as a brand new car. I cannot tell you how many times I have seen a person using a power chair with a cheap plastic baggie over the controller in the rain. It makes no sense to me to manufacture a power chair with a controller that is not water proof. Does Motion Composites really expect my wheelchair to be magically removed and returned by a caregiver when I shower and steam up the bathroom? As I wrote yesterday, the wheelchair industry makes no sense. Tomorrow i will continue this theme as I further deconstruct the wheelchair owners manual. Since I started this blog in 2007 I have posted on a regular basis. I write for myself but also for all those with a disability who oppose ableism. In recent weeks many people have reached out to me about my extended silence. Never before have I gone so long without posting at Bad Cripple. I am alive and well but in late October my very existence spun out of control. For quite some time I was deeply depressed. I considered giving up. Giving up writing. Giving up the fight for disability rights. Giving up teaching. Giving up on life. Despair overwhelmed me. All this was triggered by a single life altering event. 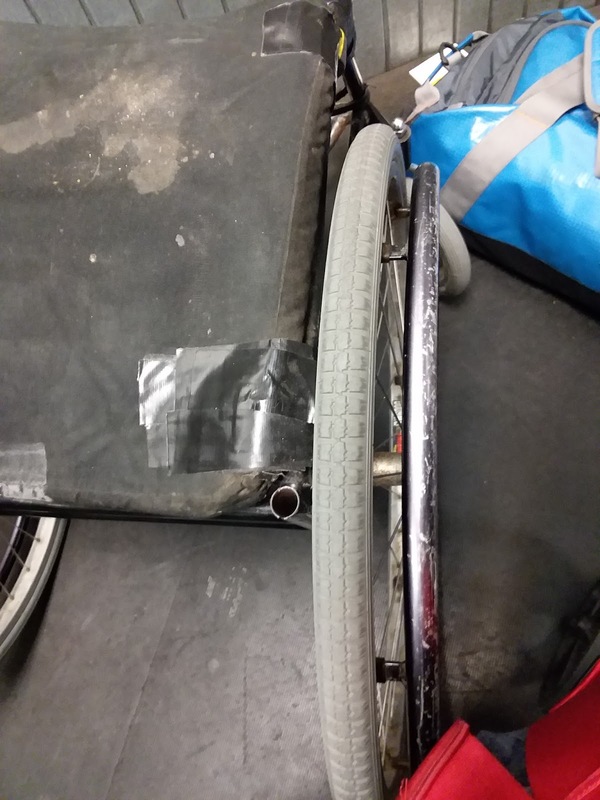 On October 28, United Airlines destroyed my wheelchair. Upon arrival at Denver, my wheelchair came out of the cargo hold in pieces. I was stunned by the destruction. 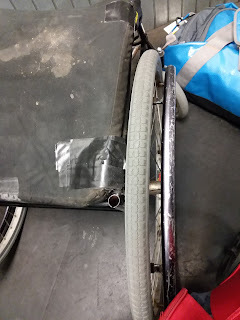 My wheelchair was over engineered in the extreme. It was heavy. It was rugged. It was built with triple redundancy so the frame was as rigid and strong as humanly possible. I cannot imagine the great force required to destroy my wheelchair but destroyed it was. Since October 28, I have been in a mind numbing stupor. Upon seeing my wheelchair in pieces my first reaction was disbelief. I felt as though a part of my body had been amputated. My wheelchair is not akin to my legs--this terrible analogy is often used by health care professionals and those that do not use a wheelchair. My wheelchair is not a body part but rather an extension of who I am as a human being. As I sat in a deeply uncomfortable chair and in pain late at night in a nearly deserted airport I knew that my life had been radically alerted. I knew instantly that my life would be comprised for weeks if not months and possibly years. Disbelief quickly gave way to mourning. I am not ashamed to admit that I shed many tears on October 28 and the weeks and months that followed. I castigated myself for flying. Every time I fly and my wheelchair is taken away and stored in the cargo hold I know there is a distinct possibility that it will be destroyed. The airline industry destroys wheelchairs and all sorts of mobility devices on a regular basis. As I cried none of this mattered. I missed my wheelchair. I knew exactly how to move. I knew how it rode when the front bearings were worn out or new. I knew the exact tire pressure at any time. I knew its tipping points. I knew how far I could lean forward, backwards or to the side without falling. I knew how it reacted to sub zero temperatures and the heat. I loved how the frame creaked when I was outside in frigid weather. My wheelchair rarely failed me. There was not one extra screw on the wheelchair. Every screw had a purpose. No more than three allen wrenches were required to make basic adjustments. A single allen wrench set could empower me to do anything I wanted to the frame. My wheelchair was a simple elegant design. My loss is immeasurable. 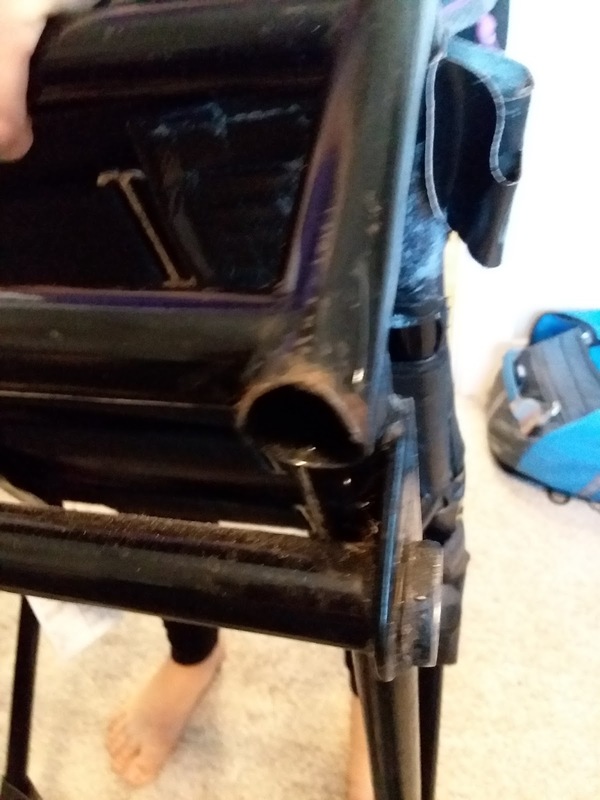 The destruction of my wheelchair absolutely devastated me. Since that night, I have wondered, feared really, about the quality of my life. I was shaken to my core in large part because I knew that it would be long time (months) before my life would return to normal. That night airline personnel were as shocked as I was by the destruction. Two United Airlines employees told me they had never seen anything like it in their careers. It was instantly apparent my wheelchair was destroyed beyond repair. Judge for yourself. As the photographs illustrate one back upright was completely sheared off. The other upright was also broken and was held on by a thread. The bottom close up shows a part of the frame was sheared off and completely missing. What the photographs do not show is that the frame itself was badly bent and the left front wheel was damaged. Since I arrived in Denver on a late Saturday night, there was precious little help available. A ground maintenance crew worked with me to jury rig the wheelchair so it was somewhat operational. We used two squeege handles to use as temporary uprights. I had enough support to have a tenuous sense of balance. The best I could do was get out of the terminal, file a claim and hope a loaner wheelchair could be found. The odds of this happening quickly were nil. The fact I had to file the claim at the baggage claim office emphasized how unimportant the airline industry considers wheelchairs. United Airline does not directly deal with broken wheelchairs. They use an outside contractor, Global Recovery Network, to find a loaner wheelchair and eventual replacement. On October 28 I was repeatedly assured United airlines would do everything in their power to replace my wheelchair. I was beyond skeptical. Wheelchairs are not cheap. Worse, wheelchairs are poorly made. Wheelchairs are not built for the end user in the United States. Wheelchairs are constructed to meet insurance standard price points. Wheelchairs are not built to last. A decent manual wheelchair costs thousands of dollars and likely will last three to five years when rigorously used. In short, I was screwed. Everything I wanted to accomplish in the months ahead would not get done. I dreaded the future. Beyond the emotional devastation, I was well aware I could not function. I could get around my apartment but there was no chance I could go outside. I could not shower because I use the back uprights to balance getting out of the tub. I was also at a high risk for a skin break down because I was sitting differently. The temporary uprights were flimsy at best so the next day it was off to the Home Depot for something, anything, that could operate as an upright. 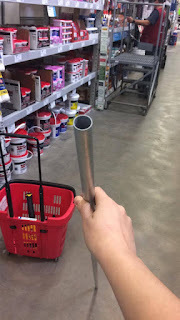 Metal conduit pipe was the best solution. Along with copious amounts of duct tape I fashioned a weak upright. I still could not go outside but I was not at a significant risk for falling. The following days were spent on the phone with United Airlines and Global Recovery Network. Trying to get an appropriately fitting loaner wheelchair was going to be very difficult--think needle in a haystack. I have long legs that require my wheelchair be very high as in floor to seat height. Getting a loaner wheelchair and eventual replacement was going to be a slow laborious process. Most of my days were spent on the phone with United Airlines and Global Recovery Network. It took a week to get a loaner wheelchair that was remotely useful. Very quickly I realized that until a new wheelchair arrived pain was going to be a constant companion. Within seven days I also developed a superficial pressure sore on my buttocks. My seating position was extremely poor and placed too much pressure on my skin. What sticks out in my mind months later is how well United Airlines and their subcontractor Global Recovery Network acted. Phone calls were returned promptly. Every person I spoke with was the consummate professional. United Airlines assured me again and again that I was to get the best replacement humanly possible. One gentleman from United who I particularly liked told me "we are in the airline business. We know nothing about wheelchairs. Get what you need. We broke your wheelchair and we will replace it. Global Recovery Network knows how to facilitate this." What I appreciated was the system in place to replace my wheelchair. There was no ambiguity. We broke your wheelchair. We will replace it. Global Recovery Network did indeed know how to facilitate the process. What United Airlines and Global Recovery Network cannot do is make those charged within the durable medical industry for replacing wheelchairs act quickly or professionally. I have avoided the wheelchair industry because decades ago I realized they provided abysmal customer service. Ableism is rampant in the wheelchair industry. The end user is treated as an incompetent annoying child. Getting a new wheelchair I knew was going to be a painful and laborious process. I do not understand the dysfunctional wheelchair industry. The complete and utter lack of professionalism is shocking. The dealer I was forced to interact with was terrible. Phone calls and emails took days to return. The reviews for the company on Glassdoor and multiple websites were scathing. To get a phone call returned required pressure from United Airlines and Global Recovery. The office person I had to deal with was point blank rude and condescending. Yes, they would replace my wheelchair but it would be done at their pace, at the times and dates they chose. It was not until November 8 that a person was even available to meet with me. This initial evaluation would start the process of ordering and selecting a wheelchair. While office personnel were miserable to deal with, the two people who actually came to my home were competent professionals. The seating specialist knew the industry and the technician knew how to adjust a wheelchair. Yet even these people can only do so much. It was not until the day before Thanksgiving, November 22, that two demo wheelchairs would arrive. Almost a full month had passed. A wheelchair had not even been ordered. Did anyone think about the quality of my life? It is one thing for an airline to destroy a wheelchair but what is never ever discussed is the ramifications. I lost months of time. Even today some three months later I am still dealing with the fallout of my wheelchair being destroyed and not replaced in a timely fashion. Exactly what are we wheelchair users supposed to do? Well, what I did was cancel plans thanks to a skin sore that prevented me from sitting. Life got pushed to the wayside. Pain became a constant. Yet there was no rush, no sense of importance from the company to replace my wheelchair. For goodness sake, a month went by before I could even see the two wheelchairs that might work for me. This is unacceptable. An evaluation should have been done within 48 hours of my wheelchair being destroyed--that should be the industry standard. I should have been treated with respect by office staff at the durable medical goods company but was not. Amazingly, I was told by many the company I dealt with was better than all alternatives in the state of Colorado. United Airlines and Global Recovery Network shared my feelings. The wheelchair industry is dysfunctional and we people with a disability suffer. And believe me in the last months I have indeed suffered. While I have not dealt with wheelchair manufacturers, I do follow the industry. It took a matter of days to realize my choices in terms of wheelchairs was limited. Based on my TiLite loaner wheelchair, I knew even the titanium frame would not last long. Everything about the TiLite line and its competitor Quickie models was cheap. Poorly constructed and designed, these wheelchairs were not meant to last. I estimated a frame would last two years at most. Only two wheelchairs would possibly work. A Panthera, the lightest wheelchair manufactured of carbon fiber or the Apex also made of carbon fiber made by Motion Composites. It took less than five minutes to reject the far more expensive Panthera (with upgrades it would cost well over $10,000). It is a beautiful wheelchair. It is slick, has great design lines, and phenomenal look. It really could be in a museum. What it had that I despised was branding everywhere. The wheelchair screamed money. Yes, this is a wheelchair for the 1% and they want the world to know it. As the architect Louis Sullivan argued, form follows function. The Panthera is a museum piece and not truly functional. Given the cost, it is wildly impractical. Forget about spare parts or be willing to wait a long time for them. Forget about working on the wheelchair if something goes wrong. More to the point, am I going to realistically put a $10,000 wheelchair in the hold of an airplane? Not a chance. I decided to go with the Apex wheelchair with the costly carbon fiber frame upgrade. I also added multiple upgrades such as spinergy wheels. 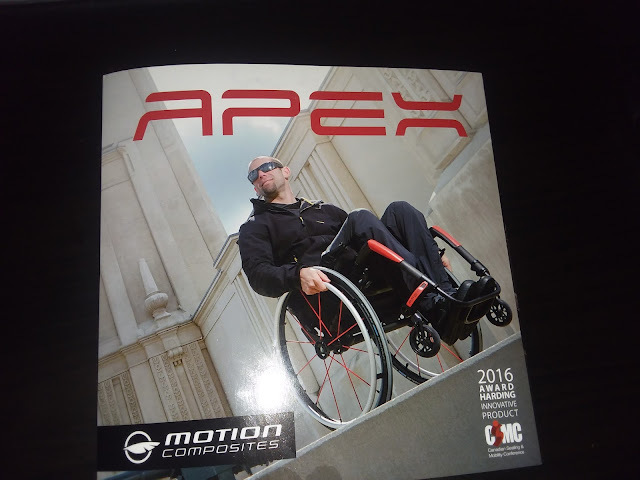 The Apex wheelchair arrived on a late afternoon shortly before Christmas. The seating position is a radical change for me. Modern wheelchairs are squat, take up little space, have small front wheels, narrow one inch rear wheels, and are low to the ground. My old wheelchair was quite long, heavy, had 8x1 3/4 front wheels, 24x1 3/8 ths rear wheels, and a high back. It was a 1980s design and looked antiquated by modern standards. From time to time young paralyzed people would look at my wheelchair with a sort of curious disgust. I would laugh and tell them that my frame is likely older than they are! As I write these words, I am sitting in my new wheelchair. It is all black and rather Darth Vader looking. I don't know my wheelchair well. The first four weeks using the wheelchair were filled with pain. I hurt everywhere from the changed seating position. All balance points were different. I worried about falling constantly. My skin was getting red from pressure in places it has never been before. I had to build up the amount of time I could sit in it daily. It has only been in the last week that I do not spend many hours in bed relieving the pressure on my skin. Getting on and off the train has been an adventure. With solid small front wheels I need to lean back far more often than I ever did when navigating cross walks. The first trip to Denver via the train was a nerve racking experience. Just imagine you have sat the same way for nearly forty years and suddenly your spouse throws out your favorite chair. October 28 was life altering in ways that are hard to explain. By way of analogy, how can one explain paralysis to those who are not paralyzed? Any competent neurologist would classify me as a T-3 complete paraplegic. How do I explain that I do indeed have sensation but far from typical. How do I explain the constant burning in my hips that in no way conforms to a pain scale of one to ten? How do I explain that cleaning a wound on my foot is painful but only hours later? How do I explain I could be outside all day in frigid temperatures skiing or biking but get cold eight or nine hours later? How do I explain the destruction of my wheelchair left me unable to write for months on end? How do I explain the emotional trauma caused by the destruction of my wheelchair? How do I explain the love lost for my old wheelchair? 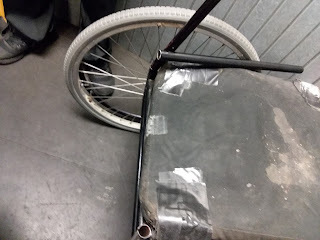 How do I explain the flood of tears of tears as I threw my old wheelchair frame in a dumpster? 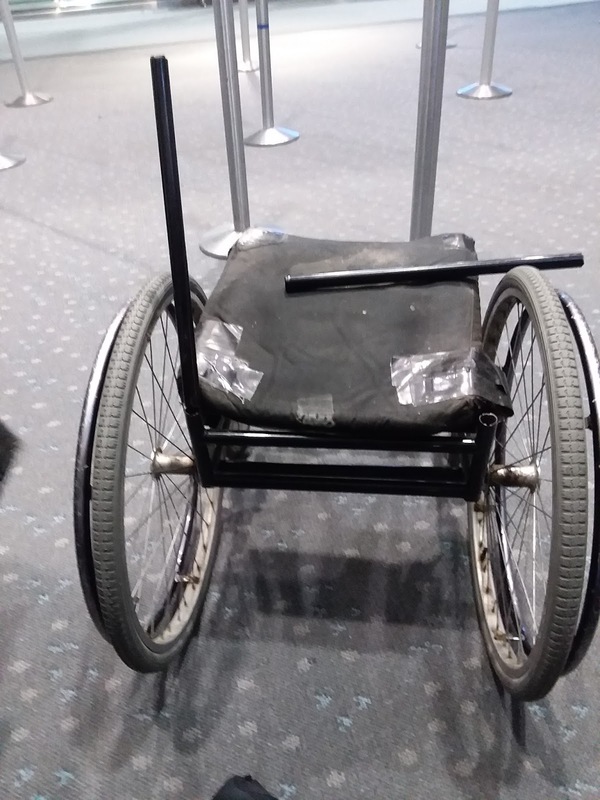 How do I explain how outrageous it is that airlines destroy wheelchairs on a regular basis? How do I explain the weeks and months lost? I do not have any answers for the above. I do know the destruction of my wheelchair has changed the direction of my life. It has thrown me in a way beyond that is beyond imagination. A part of me died on October 28. It was not until today, February 1, that I can begin to adapt; but adapt I will. We cripples are world class adapters. I have the potential to fall in love with my new wheelchair. I liken my experience to the birth of a child. My wheelchair is like a new born infant who I don't know yet love. There is much for me to learn. What I don't know is if my wheelchair has a soul. To date, it feels cold and clinical. Carbon fiber is light weight and strong. Indeed, the frame weighs just 9.2 pounds and feels as rigid as steel triple its weight. I have not become one with my wheelchair. The human wheelchair relationship is akin to a unique symbiotic relationship. What I need now is time. Time to forge a relationship with the amazing piece of technology I use and sit in. To this end, I will be posting a lot in the coming days about my relationship with my new wheelchair. I do so in the effort to bridge the cultural gap between those who use a wheelchair and those that do not. Unlike the bipeds that surround me, absolutely no stigma is attached to wheelchair use. In fact, I see a wheelchair as one of the most empowering inventions ever made. The problem as I see it (and always have seen it since I read the Body Silent) is cultural. We as a culture devalue those who are different. The more obvious the difference, the greater the stigma. This cultural divide is hysterically evident in the Apex wheelchair manual. About the only laughs I have had in recent months has been reading the wheelchair manual. For the last 40 years I have been using a wheelchair all wrong! I will be posting about this frequently as it is rich fodder for humor and cultural analysis. So yes I am back. May the bigoted bipeds tremble as I roar about in my sleek new rigid carbon fiber wheelchair.